Born/lived: born in New Orleans, LA /also lived in Mandeville, LA. 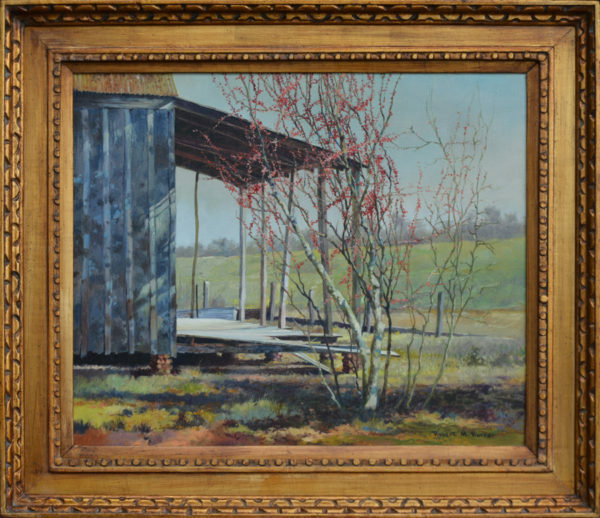 Known for: Louisiana landscapes, plantation homes, steamboats, and other aspects of Louisiana life and culture in oils and watercolor combining realism and impressionism. He was influenced by the nineteenth-century Louisiana landscape school of painting and the romantic descriptive images of Richard Clague (1821-1873), William Henry Buck (1840-1888) and Marshall J. Smith (1854-1923). His mature subjects recreate Louisiana in her golden past with amazing historical accuracy, in both detail and composition: sternwheelers steaming down the Mississippi (his father was a steamboat captain), colonial plantations set among cotton fields, rustic moonlit cabins, stands of old cypress in the bayous, and solitary live oaks garlanded with Spanish moss. Studied: Rucker grew up in New Orleans during the Depression. At 15, he and his mother opened his own French Quarter gallery, painting an average of five paintings a month. When he was 17, he was stricken with polio. Because of this, The Louisiana Department of Education funded his education at the John McCrady School of Fine Arts in New Orleans. One-man shows in New Orleans at the Isaac Delgado Museum of Art, Royal Orleans Hotel, Louisiana National Guard Convention and Trial Lawyer Convention. Taught: Rucker taught painting in his own studio and courses in art and ceramic for the New Orleans Recreation Department. He worked as a textile designer and as a medical artist at Tulane University School of Medicine.